This Sunday from 11 am to 5 pm, the City of Austin will hold an event at 5359 Burnet Rd, outside the Halina Day Spa (Clay and Lawnmont), to show off a new cross-walk beacon and explore inexpensive ways to make Burnet Rd more pedestrian-friendly. Ice cream, games and live music will be provided. This is something I support. In fact, the event is very similar to a ‘Walktoberfest’ event concept that Sustainable Neighborhoods and Violet Crown Community Works explored a few years ago. That said, I also have misgivings. They are not about the event per se, but rather about the event’s place in the City of Austin’s wider strategy for corridors like Burnet. Here are four questions to consider as you attend the event. What can the space do for people? Will the space benefit people of all ages? How will such spaces be acquired? How much will the space contribute to connectivity? The City has invested most of its time and resources to the narrow ‘streetscape’ right along the corridor. This “Great Streets” vision makes the corridor accessible not just to cars, but to pedestrians, cyclists and transit-users. zone is also what I call Too Loud To Linger. The traffic exhaust and noise (typically 20 dB higher than a block off the corridor) intrude on the pedestrian experience. More on this here. Space right along the corridor is suitable for shopping or reaching transit, but can’t serve as a calm place for the community to gather, for children to safely play, for people to get a breath of fresh air. Even flagship corridors like South Congress suffer from this. Here is a photo of my six year old in front of the Big Top Candy store, from a bike staycation our family took this summer. She wanted to get outside for a bit to warm up. But once outside, she spent the whole time cowered down next to the window. Happily, the Burnet Better Block event is not right up against Burnet. The City is temporarily closing off an entire block of Clay Ave, so that most of the space is farther from the street and suitable for most any kind of plaza or park function. A parklet in this space could have shaded seating, a playground, a water feature, games, landscaping, or whatever else the City or adjacent businesses can scrounge up funding for. The air and noise quality would be acceptable. A space like this not only draws people to services and transit. It can serve as a place where the community comes together. The City is billing the event as one for all ages, including families. Here again, the event concept is very similar to the Walktoberfest concept that my group explored (sans beer). But the location of the site aptly illustrates how housing policies will slowly and permanently skew the community’s demographics. Almost no families live in the big VMU’s located on either side of the event site. These two big apartments represent hundreds of units, whereas the proposed policy to put family-suitable ‘missing middle’ housing in areas behind the corridor would yield an order of magnitude less housing. This over time will affect the mix of retail and services, as has happened in areas closer to Downtown. It could affect the programming of the park itself. If most people living near the parklet aren’t kids, then why invest in a playground? The City’s zoning reform process, CodeNext, has not made housing balance a priority. To have even the possibility of a balanced community by age, you need upwards of 70% of the total housing to have more than one bedroom. The City’s recent proposal for affordable housing called for a minimum of just 25% multi-bedroom housing, and that was only for the subsidized units. Most new housing is market rate, and that housing along Burnet is yielding about the same distorted unit mix - only 25% units with more than one bedroom. How will the space be acquired? Acquiring space slightly off the corridor will be incredibly hard. The land is expensive and getting more so. Unfortunately, no one at the City is currently championing this priority. Parks Department has yet to prioritize open space acquisition near corridors. PARD is cash-strapped and tends to acquire park space where it is cheapest, not where it is most useful. The recent CodeNext ‘prescription’ papers that lay out in more detail how future zoning will work don’t offer a strategy for getting open space in support of corridor mobility. The upcoming mobility bond seems to only fund improvements in the Too Loud To Linger streetscape next to the busy corridor. Sunday’s Burnet event hints at one desperate strategy – street closures. The last block of a side street is closed off and turned into a kind of pocket park. Such a strategy has been explored in other cities. But this approach works best in places closer to downtown, with lots of small streets along the corridor. It’s still fairly convenient for traffic to get out on other streets that weren’t closed off. Out here on Burnet, the block sizes are larger. Closing one street puts disproportionate traffic down the remaining streets. To get the best trade-off between value and cost, mobility open space needs to be obtained where it does the most good – on routes leading to the rapid transit stations. The Clay location is almost exactly half way between the two rapid bus stations. Its value in contributing to connectivity is not as high as would be space accessing the Koenig or North Loop rapid bus stations. That’s not to say that the community might not support a parklet at Clay. But that decision should be one for the community to make, based on a careful evaluation of the trade-offs. Sustainable Neighborhoods is pushing twin initiatives this year to make corridors work better for our community. CodeNext needs to set aggressive goals for balanced housing mix, at least for certain areas of the city like Burnet. Also, we are trying to get a resolution from City boards and commissions calling for a comprehensive strategy for “mobility open space” at transit hubs, including along corridors like Burnet. Pushing these initiatives requires volunteers to go donate time or speak at public meetings. This autumn is the critical time to push these policies. Please email me at zettner@snaustin.org to let me know if you’d like to support these initiatives, or learn more about the details. Thank you! The following is a dialogue between myself and Crestview Station resident Mary Pustejovsky regarding public space at Crestview Station. It may be of interest to CodeNext policymakers. I found your post on open space very interesting. I was a bit surprised to see the note about Crestview Station though, as being "a bit cramped". As a resident for 2 years, I found it surprising and sad that people don't understand the wonderful open space we have here and how it is used. I agree with you that where open space is found is important, but I don't think that our area is lacking in any way. At Crestview Station, we have a pocket park with a shared grill and patio where pretty much every night of the week, there are children playing (come by sometime and see for yourself). There is an off-leash dog park, a bocce court with porch swings and a grassy area (pocket park 2) and a grassy area with space for projecting movies on a wall and outdoor ping pong tables (pocket park 3). We'll soon be getting a play structure, (half) basketball court, and "hammock area" for hanging out. They are small, but interspersed such that no one must walk more than a block. My 5 year old opens the front door, says, "I hear kids" and asks if she can run to the park (3 houses away). She does, by herself. I don't know many places in Austin where that is possible. I would love to see MORE places in Austin that allow that sense of community for families, and freedom for children. My whole point is the percentage of space is irrelevant if it is well placed and has a variety of amenities for different age groups and recreation types. Please come visit some time and enjoy. We'll be happy to show you around. I've been around Crestview Station and am familiar with the small shared spaces interspersed within the cottage-style housing towards the rear of the development. I think those are very well done. They serve you guys as local residents, and should be a model for how to design transitional areas where yards are small or shared. When I talked about 'somewhat cramped', I'm thinking in terms of what it would take to turn the center of Crestview Station into the future center of the walkable community. 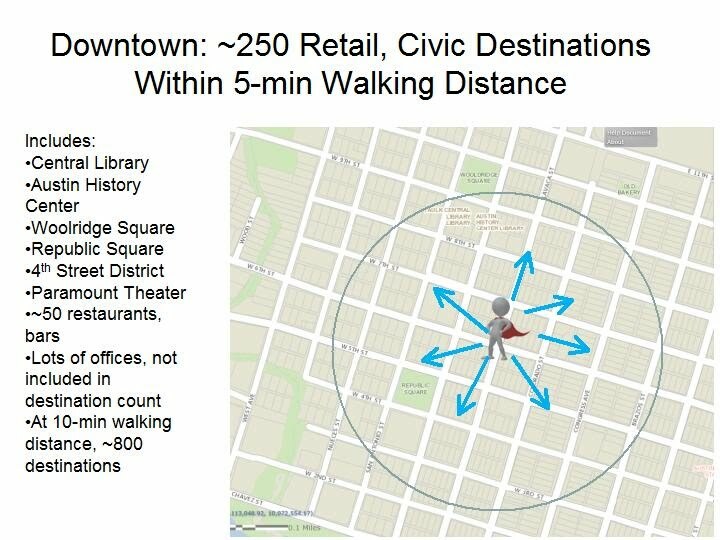 Where's the generally recognized walkable center of the center? At Crestview Station, it should have been a space about a block in from N Lamar, extending towards the street but semi-enclosed by buildings to buffer it. This would have been a larger space than what you're describing - a real pocket park on the scale of how Parks Dept defines it - 0.5 to 2 acres, maybe half the size of Brentwood Park that serves a similar function as a general community gathering space. But the location also means it would be providing connectivity through to transit and services. Think of The Triangle. Hoping this makes some sense! I think I understand what you are getting at. You seem to be saying that open space (at least in this location) should be more of a "destination" park than just one that serves local residents. I just worry that Austin has too many destination parks (Zilker, Walnut Creek Metropolitan, etc) already and not enough green space within walking distance of residents. For example, the metric the City of Austin uses is that people in the urban core should live within 1/4 mile of a park, yet sadly, only 37% do (see the report here, a little old, there may be more recent numbers). Somehow, we have a huge amount of acres per 1,000 residents (30.6 according to this report, far higher than the national median), it's just not in places where people are, or it requires people to drive to in order to enjoy, which I think is a shame. Last I checked children under 16 can't drive (at least not legally!). Every resident, old and young, deserves to enjoy green space on a daily basis--I think you and I would agree there. I totally agree with your sentiment that most of Austin’s parks are accessed by car, and we have a deficit of parks to support walkable residents. That’s been SN’s message for ten years. I’m not proposing another “regional” park like Zilker (350 acres). I’m talking about something much, much smaller – 0.5 to 2 acres, but located strategically. It’s the town square. It’s a central place where the wider community can gather, that draws people on foot or bike to transit and retail. It’s the synergy from meeting multiple public goals that makes such spaces vital. The service area for such a park is really more biking distance than walking distance. It's the place that my family and I are going to bike to from over near Burnet, when we come over to Crestview Station, to hang out and grab a beer from the brewery or do a picnic. Again, think about The Triangle and how it works. Think of a town square. We're generally not going to come back into the smaller spaces interspersed near your homes, and really, you might not want us random strangers doing that anyway. ;) Those spaces are public, but in a more intimate, local way. I guess I still don't understand why the park has to be right next to the train station. I've done some (bad) map markings to show a little bit of what I'm talking about. Everything in the diagram below that is grey is existing houses (completed). 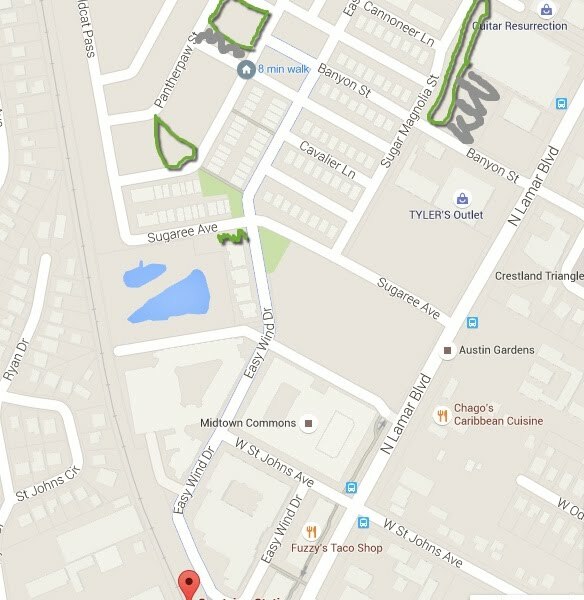 The green are park spaces planned or already present (the only one not built is the triangle). You said there should be a linear park near transit stops. The linear park near the top is grassy open space, followed by a bocce court with porch swings. At the north end, the City of Austin has said that we can use their easement behind the Austin Energy station for a community garden. ​A few weeks ago there was an open air art sale where the green arrow is (below). Finally, I wanted to make sure you knew that the community garden behind the Austin Energy station on Lamar will be open to any and all residents of Austin (as it is partly Austin property), not just those of the immediate neighborhood. We're hoping it can be an asset to the community much like Sunshine Community Gardens is a treasure shared by all who care for it. This is about a block off Lamar, and there is a bus stop on the other side of the Austin Energy property (see the blue icon). The kind of space that ideally you'd have near transit is synergizing with the things around it. It's drawing business to the retail strip along Lamar. It's drawing people to the transit area, where they are more likely to actually use it. It's providing a very pleasant, positive connection for nearby residents to walk or bike through to the transit and destinations. I can see having an art exhibit in that sidewalk zone where your green arrow is. But what about a kite festival like they have at The Triangle or Brentwood Park? How about Violet Crown? It's a matter of scale. 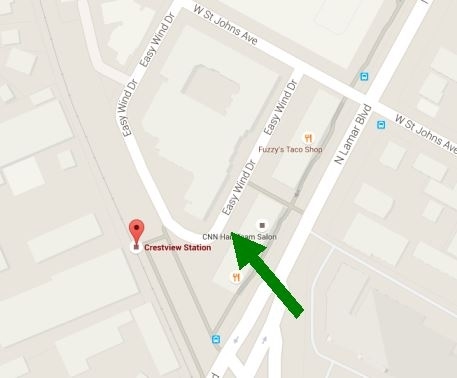 At Crestview Station, the space I'm talking about was used instead for a circulator street and three-story apartments. The developer made a decision not to build denser and not to provide extra open space. You could close off the circulator street to hold an event, but that takes effort and is only good for temporary occasions. A park on the Ryan property could work. It's a shame it's less integrated with development on the north side, but it would create a new connection into the station area. The orange arrow indicates where I think the road is far too wide and kind of useless anyway. I would love to see that part blocked off for sure, it serves very little purpose. I think it was originally supposed to be for bus stops (the shelters are even there) but they are never used. One thing you stated was that "the developer chose not to build denser". My guess is that because of compatibility with adjacent single family homes, they were not allowed to build taller. I agree that things could have been done better, but overall I think there is a lot of good and a lot that can be learned from the area. Yes, it’s easy to criticize, but you’re absolutely right that we need to learn the positive lessons as well. I like the cottage-scale development at the rear of Crestview Station and the small parklets that serve you guys. I like the plaza space up on N Lamar and the balcony effect of the Co-op. The space to the rear of the plaza was a missed opportunity. Your idea of reclaiming the road behind the transit station has merit. I don't know if there are service or emergency vehicle issues. Maybe swap out pavement for cobblestone, or just put barriers that make it pedestrian-centric but with limited vehicle access. And then program and integrate it with whatever comes on the Ryan property. The rules in the TOD plan (link below) say there are no compatibility restrictions within the TOD boundaries. For the area around the station, the developer could build up to 45’, or 60’ if they provided affordable housing. (I got this wrong - thought the bonus was for open space). Bonus-based mechanisms are tricky. If you’re too stingy, the developer just opts out. If you’re too generous, people say you’re coddling developers. Unfortunately, bonuses are one of the few tools available in Texas to get affordable units in brand new housing. BTW, thank you for patiently and politely questioning things I’m saying that don’t make sense. You’ve forced me to take a casual observation (“Crestview Station feels slightly cramped”), and better articulate the value and details around what is, afterall, a major community and transportation investment. I agree very much that bonus programs are tricky--they have to provide enough of a "carrot" for a developer to do it or it will just be too expensive/onerous. I'm happy that we could have an exchange. I think it's always good to question our assumptions and make our positions as clear as possible. Sometimes that is hard over the internet. I really do hope that the rest of the TOD (which includes South and East of the station) will have better development, connectivity, and green space as they redevelop. That's why Midtown NA is setting up as many meetings as possible with property owners and city council members to make sure we get something that is an asset to the community at large. 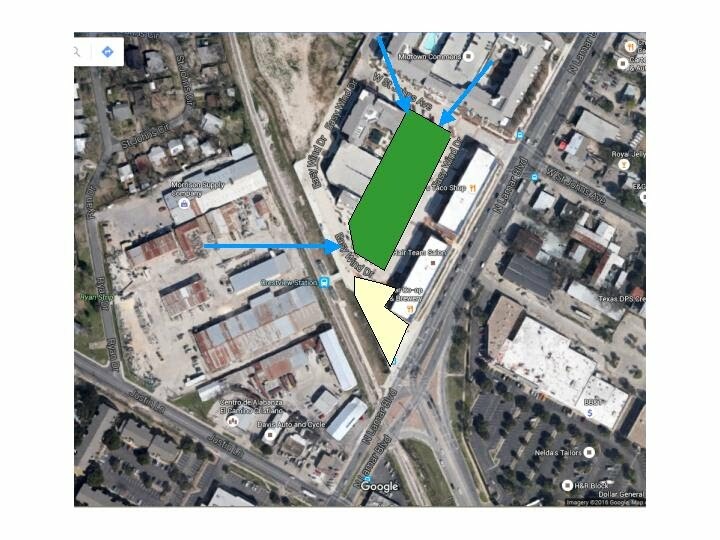 Burnet Corridor Plan Descoped. Now What? This was not a happy week for those of us trying to shape a community-friendly Burnet. City staff announced a decision to defer the Burnet Corridor Plan. The exact details remain fluid. The intent of the decision is to allow staff to stay focused on the CodeNext project to reinvent the City's zoning laws. City Council wants faster movement on this, and planning staff is undermanned. At an Austin Neighborhoods Council (ANC) Sector 2 meeting on Saturday, staff argued that a lot of work has already been done on Burnet, in particular an Austin Transportation Department (ATD) 2011 transportation study. 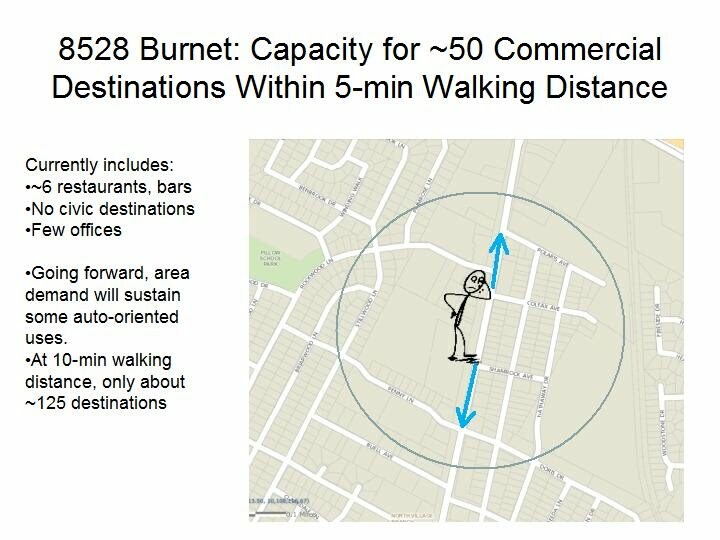 Staff proposes to leverage that work and implement high-impact, low-cost pedestrian improvements along Burnet. The "Paint and Polka Dots" project at E. 6th St and Waller is an example, described in this Citylab article. I hope most people will know that I champion pedestrian improvements in the Burnet Rd right-of-way. But we shouldn't support this proposal until we get assurances that far more existential challenges will be addressed. Here's why. 1) Right-of-way improvements are important, but the City owns the right of way and we can get those improvements over time. That’s not the case with two cumulative long-term threats to the Burnet community that come with redevelopment - 1) an unbalanced housing mix that shapes a permanent bias against families in the urban core (see earlier blog), 2) insufficient public space in the right place (see earlier blog). These two issues trump other, more obvious things because they can't be fixed later. We've got to address them as development takes place. For that, (as for all the other important things like transportation, affordability for residents and small businesses, capital project planning, and so on), we need an actual land use plan. 2) The 2011 Burnet transportation study that staff proposes to rely on only looked at the public right of way, not zoning of adjacent properties. It was a 3-month scramble (just two public meetings) to ram through some right-of-way improvements in time for the 2012 bond package. It didn't look at Anderson Ln, or Burnet south of 2222, at all. Despite repeated requests documented here, the lead consultant would not address our concerns about the study's corridor vision. 3) A crucial function of local area plans is to allow local stakeholders to help influence a balance of local vs. citywide priorities. If planning staff proceed with a CodeNext citywide mapping of new zoning, Burnet's future land use, and all the resulting impacts, will have been determined by fiat. 4) Staff's earlier direction to use Burnet to deep-dive on emerging CodeNext rules still makes sense. One of the biggest potential risks to CodeNext is insufficient testing of CodeNext rules and concepts in a real-life context and with live consumers. To my knowledge there hasn’t been a single focus group. Hands-on interviews with demographically representative sets of Burnet residents could help us understand if we are building housing that different kinds of households will actually pay for. Robust scenario modelling of zoning impacts can tell us if we will get a result that is economically viable, addresses transportation concerns, reinforces community identity, and delivers a balanced housing mix that can sustain truly intergenerational communities. Nobody wants to be a CodeNext guinea pig, but the alternative is much worse. City planning staff at the ANC meeting Saturday expressed sympathy for our concerns. There seems to be willingness to look for compromises as long as they don't get in the way of the aggressive CodeNext timeline. Council Member Leslie Pool at the end of the meeting accurately summarized our positions and promised to pursue them in follow-on talks with senior planners. I continue to believe that we on Burnet can have a valuable and constructive influence on CodeNext. I'd like to see our community help staff to help us. In my previous blog, I explored why we need a minimum amount of public space near Burnet Rd, and why it’s so important to catch that space while it's still available. I proposed a ‘linear mall’ open space model (think of UT's West Mall at Guadalupe) that puts most of the space near, but not on, the corridor. In this blog, I’ll revisit why it’s such a big issue for Burnet Rd, and why there's still risk City leaders may punt on this issue. Why is Burnet So At Risk for Open Space? The Burnet corridor, unlike Downtown but much like other commercial streets built out after WWII, was designed for easy car access. Most early suburban corridors have little or no existing public space situated to support walkable communities. Sustainable Neighborhoods first called for minimum open space requirements eight years ago. Allandale, Brentwood, Crestview, North Shoal Creek and Wooten neighborhood associations have passed resolutions in support. Yet in those eight years, the amount of public space on Burnet has gone down, not up. A particularly painful case – Travis County’s sale of the Farmer’s Market property, which used to be a community gathering space, with no provision for a meaningful gathering space as part of future development. Zoning of VMU in 2006 compounded the Farmer’s Market case. Staff wrote the VMU rules in such a way that the VMU ordinance’s modest open space provisions trumped the more community-serving open space provisions for that district in the Brentwood neighborhood plan. In 2016, the result is a super-dense apartment block, with only a modest alcove that connects to nowhere. I understand the alcove will be an outdoor bar area about a third of the area of the old Pour House courtyard. The rest of the ‘open space’ is buffering along the corridor itself, unsuitable for child play or casual conversations with neighbors. No Country for Old Men. Or Old Women. Or Kids. Or Parents. After eight years of our community calling for more public space on Burnet, we actually have less. There are numerous reasons for this. One is historic planning bias. Most planning conversations up until the last couple of years have involved the true urban core, generally south of 45th, where there is considerable legacy open space, even near the big commercial streets. Think about N Lamar near Enfield. The Shoal Creek bike route runs right under the road, providing comfortable east-west connectivity. There’s a big legacy park, some smaller specialized parks and natural areas along the creek, plus quasi-civic resources, like the YMCA. When policymakers say “we’ll do more with less,” (I’m paraphrasing here from this week’s CodeNext Prescription paper – “the new code likely will offer an options-based palette of urban-green options aimed at providing high-functioning landscape in small places”), they’re assuming there’s already at least a minimum level of meaningful open space in the area. Imagine Austin commits us to shape compact and connected communities that serve people of all ages. But the acid test is whether City leaders will commit scarce resources to achieve this goal. Land along Burnet Rd has gotten obscenely expensive. Meanwhile, Parks Department (PARD) struggles to maintain its vast and scattered network of traditional parks. In the last PARD long-range plan, the pedestrian connectivity focus was on access to existing parks, not deploying new parks to BE the connectivity within walkable communities. That’s a hugely important distinction. It frees Parks Department to buy new parkland up to 2 miles away from redevelopment - i.e. based on a drivable service area. One of the sources of income intended to support new parks in growth zones – the Parkland Dedication fee that developers pay when they build new housing – has been scavenged to pay for park space mainly outside the urban core. Recent changes to Parkland Dedication rules also apply the "more with less" principle to allow developers to provide less space in return for improvements on the space. That would be fine once a district had achieved a minimum for quantity of space. Improvements can be added later. Open space can't be. In theory, the City could help close that gap on minimum open space by acquiring parkland directly. Bonds are an obvious funding source. But in the 2012 bond package, most of the (very limited) open space funding went to maintain existing facilities, or to acquire more water quality land outside the city. The bond package dedicated just $4 million for acquisition of new parks for the entire city, and here again, most of that followed parkland dedication funding to acquire land on suburban greenbelts. To their credit, City leaders and Parks Department are seriously reviewing funding options to get more urban park space. Council Member Leslie Pool helped Parks Department get Parkland Dedication fees raised. One option getting a lot of attention is the Tax Increment Financing (TIF) district, which captures part of the increase in taxes in an area subject to growth, and dedicates that funding to infrastructure projects within the district. Unfortunately, the City is very conservative with TIF districts, and there will be intense competition for them. Some people argue that TIFs are only applicable if they stimulate new growth. On Burnet, the growth is happening anyway. Even if TIF funding becomes available for Burnet, staff may use it to do other important things like upgrade utilities and sidewalks, or build affordable housing, rather than acquire expensive transit parks near the corridor while the land is still available. Even if Parks Department had more funding, City rules prevent PARD from bidding on land at market rates. In the context of a transit corridor, PARD could not possibly buy any park space. If they did manage to buy land ahead of development, they have no mechanism to land bank it. Another thing to watch is CodeNext. Staff just released a ‘Prescription’ paper with high-level details on open space policy. At first glance, it looks like the City will let developers choose what open space features they want to build, based on a menu. That approach has pros and cons. The obvious con for communities is a lack of assurance on what outdoor amenities will get added. It’s not yet clear if strategic locations, like transit hubs, will really get the features that make them the future centers of walkable communities. How Do We Get the Public Space? The public space issue is solvable, but only with tremendous focus. Unfortunately, if we wait until the Burnet corridor process to address this issue, it will be too late. The corridor plan will rely on CodeNext rules, which are getting locked down over the next several months. City leaders need to hear from the public on this issue right now, during the CodeNext public review. In May, the City will seek public input on new rules for Parkland Dedication. I’ll send out Burnet-oriented summaries and meeting dates as such opportunities arise. Like roads, housing mix and open space are hard-to-change features. You can’t just wave your wand 10 or 20 years after development occurs. If we don’t put a credible strategy in place to accomplish these objectives before development occurs, the redevelopment itself shapes "facts on the ground" that preclude having these features later. In recent posts, I laid out arguments for the first objective – retaining a minimum mix of 70% housing that doesn’t exclude any households, in particular families. The following post explores why getting enough open space in the right place is so important to support both the community and walking, biking and transit. Why is Open Space Important? I’m using the term ‘open space’ loosely to mean any freely accessible ground-level space that supports walking (or biking). Relevant examples of public space include transit plazas and malls, pocket parks, school playgrounds, trails, sidewalks. These amenities can provide transportation, recreational, and civic benefits. Take a transportation example. In a middle class community like Burnet Rd where almost everyone has a car, each trip to the grocery store involves a choice between driving, or walking/biking/transit. If the choice is between a quick and easy air-conditioned car trip, versus a long, sweat-drenched hike along a loud and smelly congested avenue, it’s really not a choice. I’ll drive. A walk to the grocery store along a shaded path through a pocket park where neighbors are hanging out represents a completely different story. In that context, the walk can represent higher value than the drive. That’s especially the case as inner city congestion and decreased parking start to make the car trip less convenient. The 10% minimum standard comes from analysis of numerous mixed use destinations around Austin. Places that seem to work well, like the 5-minute walking radius around City Hall, have abundant open space features – 15-20%. 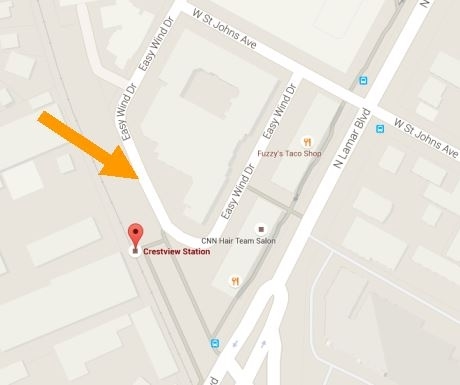 Conversely, places like Crestview Station that seem a bit cramped have about 7% open space. A 10% rule seems like a good minimum standard, but more would be better. Why Is the Arrangement of Public Space Important? The benefits that public space provides - transportation, recreation, and community-building – can reinforce each other. But to achieve that synergy, public space needs to be in the right place. In the context of a corridor like Burnet Rd, Sustainable Neighborhoods has championed a “linear mall” open space model that wrings a lot of value in terms of transportation, recreation and community-building. This model is cost efficient, because the open space is prioritized for just those places along the corridor with the most people and best transit. It mitigates some risks, like vandalism and child safety. I’m going to illustrate this open space model using the area around the MetroRapid (rapid bus) station at Burnet and North Loop. I want to emphasize that this is a concept – I’m not endorsing specific changes to any given property, nor any given timeline. There are different ways to solve for the same problem, and local residents and property owners need to be deeply involved in finding that solution during the planning process. (As someone who lives a half block from a rapid bus station, I’m sensitive to that). 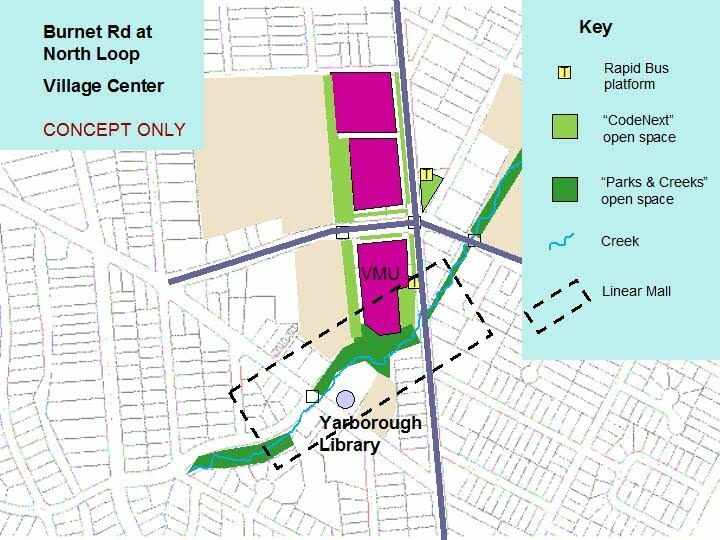 You can see an example of a ‘linear mall’ on this concept map, running from the rapid bus station on the southwest corner of the Burnet-North Loop intersection, southwest to Yarborough Library. The “business” end of the mall would be hard-scaped – a plaza adjacent to the station and to businesses. This end of the mall is mainly about transportation – getting people to where they need to go. As you get farther away from Burnet, the mall offers more nature (in this example it’s on a creek), with enough space for a playground and community events. Such a pocket park connects multiple destinations within the district. The parklet should NOT be right on the corridor where conditions are “too loud to linger,” nor so far away from the district that it would be prone to vandalism, or draw random people into lightly populated single family areas. The park’s location in a “Goldilocks Zone” not too close and not too far from the corridor draws people on foot or bike, towards services and transit. In short, the business end of the mall, and the civic-recreational end of the mall, reinforce. You get tremendous synergy from transportation, recreation, and community building. This powerful feature is located at a place on the corridor with the most residents, businesses, and overall transit quality. As a concept, it can be extended to most other rapid bus stations along Burnet or other corridors. In my next blog, I’ll explore the challenges of getting even this basic infrastructure in place, given current City of Austin policy and funding challenges. In this post we’ll take a deeper look at the relationship between children and housing, and then do a simple model of Burnet Rd demographics, assuming current housing trends, to predict where our community’s demographics end up in a generation. We’ll end with some intriguing news from SoCo. Before I start, a quick disclaimer. I am not a statistician. I am offering data with the hope it will be further refined and validated by City staff. I’ve presented these data and no one has called out any obvious errors, but nor to my knowledge has there been a formal review. 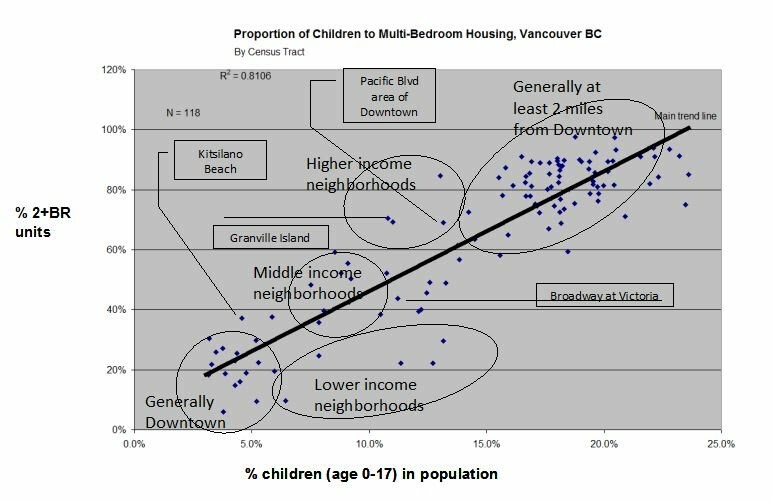 You might recall from a previous post that in Vancouver, communities with lots of multi-bedroom housing also have lots of kids. I’m using a statistical measure called R-squared (R^2). Broadly speaking, R^2 measures how close real world data (dots on a scattergraph) “fit” to a line generated by your mathematical model. An R-squared value of 1 would mean that your equation perfectly describes the real world data. (Statisticians dream about this. It never happens.) In most cases, an R^2 result of .8 or .9 means if you know one thing, you can predict the other thing. In northern cities, the R^2 fit between kids and multi-bedroom housing is strong. In Vancouver, it was 0.81 for all neighborhoods, and 0.9 for middle and upper income neighborhoods. In Boston, R^2 = .8. Portland R^2 = .87 (fit against a log curve). Seattle R^2 = .9. We don’t see these correlations in southern cities like Raleigh, Dallas, or Austin. When I run this for all census tracts in Travis County, I get R^2 = .35. That doesn’t mean a lot. What’s Going On in Austin, Texas? I’m not entirely sure why multi-bedroom housing in a place like Vancouver so closely predicts children, but doesn’t in Austin. Here are some possibilities. Austin (and other southern cities) have a lot of single family housing, and a lot of big apartments. Not much in between. We can sprawl. Given the stark choice between a Cedar Park house in a great school district but a grueling commute, and a two-bedroom unit in a big apartment and community that is otherwise not especially family-oriented, middle income families go with Cedar Park. Conversely, Austin’s notorious income inequality means lower income families will make do with whatever housing they can get, even tiny apartments. If you take out Travis County’s lower income communities and just run a correlation on middle class neighborhoods, you get a more respectable R^2 of 0.6. That’s enough to visually distinguish the arc of yellow dots (middle class communities) in the graph below. One conclusion you can’t cleanly draw from these data is a correlation between a given housing type and poverty. Lower income communities are found both in areas with lots of apartments (like Rundberg), and also in suburban communities (like the area north of Austin Bergstrom International Airport). Desperate people will cram into any kind of housing – efficiencies, ranch houses, expropriated mansions. What is striking about Rundberg is how quickly and sharply the area declined. The housing there is not that old – 1970s-80s. The main driver here was probably economic, but the high concentration of big, aging apartments may trap poverty. One hint – median incomes on the northwest corner of Lamar-Rundberg are $10,000 higher than on the southeast corner. The southeast corner has a much higher concentration of big apartment blocks with single occupancy units. What’s going to happen on Burnet Rd? The future is here! Burnet Rd already has a neighborhood that reflects the kind of demographics we could have for the entire area a generation from now. It’s “Baja Brentwood.” In the housing/children graph, southern Brentwood’s housing is close to 50% efficiencies and one-bedrooms. And its weight of children in the population has fallen to just 11%. Gentrification is in full swing. The housing mix continues to shift towards more single occupancy units. Families are locked out of half the housing market, and are competing with everybody else for the other half. As housing rents skyrocket in Brentwood and throughout the urban core, it becomes harder for families to remain. Less safe outdoor conditions from chronic on-street parking, and the relative decline of family-oriented area services, accelerate the outflux. This last graphic attempts to model, in broad brush strokes, what kind of housing mix we’ll have on the middle part of Burnet Rd (from 2222 to Anderson) in 25 years. Assuming at trend construction of new apartments on land already zoned for them, plus some ‘transition zone’ housing along the edges of the corridor as a result of CodeNext, the area’s housing mix winds up as majority single occupancy units – not too different from what we have in Clarksville near Downtown (54% efficiencies and one-bedrooms; children at 10% of the population). This happens despite the transition zones. The demographic weight of the big apartments just overwhelms everything else. A closer look reveals a little Bouldin baby boom. For years, the story in Austin and other cities has been predictable – those young families will pack up and leave for the suburbs. But if Bouldin represents a millennials-driven shift in market demand, it could become easier to make the case to RECA for housing that doesn’t exclude families. Traditional families with children today count for just 20% of the population in the U.S., yet our current land use code assumes that traditional suburban large family housing is and must be the norm. It's a sign of the times that millennials have been squished down into the lowest common denominator of housing possibilities due to income stagnation, limited housing supply, and staggering student loan debt. [Steven] I guess every demographic group feels some sense of slight. ;) Children in all households are 24% of US population. Expected decline to 23-22% over coming decades. Nothing like the 3-5% levels seen in most downtowns. To that percentage you have to add parents, so say ~40% of the population. What’s happening in Austin, and around the country, is that older garden style apartments that used to have a higher mix of multi-bedroom units and more open space are being torn down in the central core and replaced with very dense blocks with a much higher mix of single occupancy units, less open space suitable to kids, and lifestyle amenities that don't work well for families. Most of the ‘family-friendly’ housing is getting built in the suburbs. The result: de facto age segregation. The child demographics of Austin resemble a donut - 20-30% children in suburbs and 3-10% in the core. But I’m speaking rhetorically – you are a parent and very aware of this. [Patrick] Exactly. AISD is losing students. We simply don't have enough family friendly housing in the urban core. And empty nesters camp out in their one-story bungalows for lack of alternative (affordable) options. If CodeNext allows for the kind of missing middle housing I've championed for years, and developers don't step up to the plate, I'll look into doing at least one such development myself. The responses I got when showing the plans around were largely "I want to live there." This mostly came from people living in bungalows, not apartments. I think the trend among millennials is to try to stay in walkable, transit-oriented housing in the urban core. When they start having kids they simply can't find anything appropriate that they can afford and end up moving out to Pflugerville or Cedar Park. The millennials I know can endlessly catalog their friends who have gone through this. There's a desperate need for such housing right now. [Patrick] I agree with your assessment that we need a more balanced housing mix. The key to that is more density, not less. In one much discussed zoning case on Burnet Rd [the Gordon Automotive apartment project, January 2015] council members Kathie Tovo and Leslie Pool asked for more 2-3 bedroom units. The developer said he would need MF-6 zoning in order to be able to monetize the project with larger units; with MF-4 he would only do one bedrooms and studios. Both council members then voted to support MF-4 zoning. Height restrictions and compatibility requirements are the biggest enemies of a better multi-family housing mix. In a market where anything you build will rent combined with a very limited envelope in which to build, developers will definitely maximize their profits by doing only one bedrooms and studios. [Steven] The Gordon Automotive zoning case that you’re referring to, and that I supported at MF4, was never going to yield much family-suitable housing, nor amenities suitable to families. The developer said as much. It wouldn’t have mattered if it was MF6 or MF4. The developer’s proposed mix at MF6 was still 70% efficiencies and one bedrooms. MF4 projects around town yield about that same mix. Because the project is so dense and so unbalanced, it contributes to the trend of unbalanced housing mix in our wider community. I want to be clear – I’m not opposed to higher density projects, especially if they are in those places along the corridor with the best transit and walkable amenities (not the case at the Gordon Automotive site). But if under the current rules and market conditions you are going to build big super-dense apartments that hugely skew the local housing mix, the only effective tool currently available to protect local diversity is to ration such apartments. The rationing mechanism I've proposed for Burnet, and that has Imagine Austin behind it, kills two birds with one stone. You use a 'compact and connected' model to zone for big apartments where they are best supported by transit and conditions that get people out of cars. The farther you get from the transit hubs, the lower the density. This compromise yields the most ‘missing middle’ housing. It’s a compromise because that missing middle comes from both adjacent neighborhoods and along the corridor. IF the City makes improvements to transit quality and walkability, the definition of your 'transit-supported area' can adjust over time. [Patrick] The counterargument is that if we define (you'll agree, somewhat artificially) transit hubs and restrict higher density corridor development to those locations, then there simply will not be enough developable parcels on the market. Certainly not every property owner in convenient locations is going to be interested in selling. For this reason I'm OK with these units being mostly studios and one bedrooms. Families with children don't want to be right on Burnet anyway. We provide housing for families in neighborhood interiors by deploying missing middle housing (which can comfortably afford a 4x increase in density. By allowing for, for example, corner stores in all neighborhoods, this also provides space for daycares and other family-oriented services right in the neighborhood interior. And by moving young singles out to the corridors, we reduce interior neighborhood demand, consequently increasing affordability. [Steven] You’ve concisely captured the orthodox urbanist view of how redevelopment is going to work for everybody. I don’t buy it. A project like Gordon Automotive, which is 70% single-occupancy units, is 34x the density of single family housing. You’re a math guy. Tell me how, even with a (family-friendly?) ‘missing middle’ transition zone at 4x the density of single family, putting apartments all up and down the corridor is going to allow for a balanced housing mix? There’s no evidence that the current urban market will self-compensate with more family-friendly housing. I visited Vancouver last summer, a city way ahead of Austin in terms of transitional housing. I witnessed the unbalanced redevelopment occurring in ‘near-downtown’ neighborhoods, and the homogenizing impact to services and demographics. It was a feedback loop. Burnet can be child-friendly. Not if the pedestrian focus is right along the side of the corridor. That’s crazy. The pedestrian focus needs to be a block off the corridor. I do agree it’s currently hard to assemble properties for redevelopment at hubs. CodeNext is supposed to simplify that. [Patrick] I don't know about Vancouver. I think the urban core there is quite expensive, which likely discourages families with children from living there, and the suburbs that I'm aware of are just outside the core neighborhoods with excellent bus service and other suburbs connected via an elevated rail system. The suburbs I've seen there are still close and connected, so more like Allandale than Round Rock. [Steven] Affordability and services mix are important, but the hard constraint on age diversity is housing mix. Downtown Vancouver has a pocket neighborhood (False Creek near the science center) where the city required higher ratios of apartments designed for families. The ratio of children there is above 10% of the population. Still not completely balanced. But good for a downtown area, and spot-on consistent with that neighborhood’s housing mix. [Patrick] BTW, your concern about losing family-oriented businesses on corridors is probably not a real worry. VMU requires ground floor commercial, and commercial space is way, way overbuilt all across the country. This is why there are so many half empty strip malls and dying shopping centers. Most developers who build VMU just write the required ground floor commercial off as a business loss and part of the cost of getting VMU residential. There is now and will continue to be plenty of space for daycares. What we really need is a few more family-oriented restaurants that serve real food. I am awfully tired of going to Phil's Ice House with the kids. [Steven] Yeah, Phil’s for all its awesomeness gets old. But I stand by my remark that housing and retail mix are related. VMU preserves, but doesn’t grow, the commercial space along Burnet. What’s shrinking is the service area. As congestion gets worse, you can no longer hop in your car and drive 2 miles across the city to some restaurant like we did when we were kids. Your main choices are those within a walkable area (supplemented by the occasional transit trip). And those choices are mainly defined by the local demographic. As big apartments fill in along the corridor, their sheer demographic weight determines what businesses go in adjacent. [Patrick] My favorite example of family-friendly urban is the Prenzlauer Berg district in Berlin, where I stayed a few years ago. Very densely developed (Berlin has virtually no single family homes -- everyone lives in multi-family housing) and crawling with kids and families. Wide sidewalks, generous bike lanes, abundant parks, and affordable housing are the only necessary ingredients for family friendliness. We can easily achieve that here as well, we just need the will to do so. In Berlin, affordable housing is a direct result of abundant housing and (until recently) a relatively stable population. Yeah, you live in multi-family rental housing, but most people's rents are less than my monthly property tax. [Steven] Berlin sounds like a well-executed case of child-friendly urbanism. It may be tricky to replicate in Texas. As you noted, Berlin’s population wasn’t growing wildly. Also, for decades after WWII, Berlin was either a walled-off island, or subject to diktat housing policies. In Texas where land is abundant, the market is just pushing families into the suburbs. We’d need firmer land development policies to get there. [Patrick] Thanks. I'm a fairly solid supporter of using a density bonus program to achieve community goals. Requiring a decent mix of housing type/sizes perhaps would be a good thing to add to such incentives. [Steven] Density bonuses won’t get us there. But a hard requirement could transform the Burnet Rd planning conversation. The first benchmark probably seems intuitive – good walkable places have some space for people to walk and gather. In a future blog I’ll go into some nuances around arrangement of this space and the challenges of actually getting enough where land is so expensive. But hopefully most people get the value-add of transit-oriented public space. I need to connect some dots to explain the second benchmark on housing. The intent of the second benchmark is to ensure that our housing supply doesn’t inadvertently and permanently lock out parts of our population. Achieving a true mix of housing types will be one of the hardest things to do. The Austin real estate market (like other urban markets around the country) is geared up to build lots of urban housing for young adults. That’s seen as the primary urban demographic, and Burnet Rd happens to be a centrally-located corridor with aging properties suitable for redevelopment as dense apartments. So if policymakers do nothing or deploy band-aid solutions, mostly efficiency and one-bedroom units are going to get built. "Inclusive" housing (simplified, this means at least two bedrooms) can be used by families or anyone else. Efficiencies and one-bedroom units generally don’t work for families, or at best become housing of last resort when nothing else is affordable. A 70% benchmark for "inclusive" housing seems to represent the minimum needed to retain a natural balance of people by age in a community. (More on this below). Changing the rules and zoning to get a more balanced housing mix for Burnet Rd will be really hard. It’s not just that developers don’t want to be told what to do. Balanced housing also means less affordable singles-oriented housing. The square footage allocated to one 3-bedroom apartment could have yielded 2 or even 3 efficiencies. So before I say more about housing, let me make the case for why it’s important for Austin to have at least some diverse, age-balanced urban communities in the first place. 1. Most people like inter-generational communities. The average person prefers to live in a community with a mix of singles, couples, families, and seniors. In the Burnet Rd area, 43% of last year’s SN survey listed our diverse community as a top reason for living here. The real estate community recognizes this. "According to many builders and developers, the housing choices of those 55 and older are varied and location-dependent, but they reveal a definite trend toward more active and intergenerational living that is closer to family, friends, and their extended community." Imagine Austin directed staff to pursue a "creatives class" economic model. This model has the advantage of looking ahead to a world where smart, educated people generate most of the wealth. Conversely, it is a mono-cultural strategy, one being pursued by most other urban areas in the country. Cities that over-rely on a single economic strategy tend to experience boom-bust cycles. In some cases, like Houston in the 1980s, "bust" leads to innovation and diversification. In other cases, like Detroit, "bust" becomes permanent. Diversity is the key to sustained economic health. Age diversity is the hand maiden of economic diversity. We need young creatives, of course. But we also need blue collar workers, and seasoned managers who bring a mix of creativity and experience. A lot of that manager-level talent pool (I’m thinking here of my employer, Charles Schwab) resides in Cedar Park, not downtown Austin. Austin’s urban economy also needs those people to compete. Age diversity makes our local Burnet Rd economy resilient. People spend on different things at different points in their lives. Young people and childless couples with disposable income are boosting the restaurant and entertainment sector. Families spend a lot on daycare (a major employer of young people). Seniors spend on healthcare (ditto). A mix of generations stabilizes housing prices. Putting more family-friendly housing in urban places is a smart resource play. AISD will have to raise taxes to add new schools at the edge of town. Allowing families to live near underutilized urban schools (Burnet Rd has two underutilized campuses – Read and Rosedale) saves money for families and taxpayers. Mixing middle class students with disadvantaged students (the preferred ratio at schools like Lamar MS is 2:1) shapes positive educational opportunities, at no additional cost to taxpayers. Cities are supposed to be more environmentally and fiscally sustainable. But are they really sustainable if they are designed in a way that relegates children and their parents to the suburbs? Let’s take those mid-level managers in Cedar Park. How many of them are driving into Downtown every day, 40 miles round trip? How sustainable is that? Not every part of Austin’s core has to be "family-friendly." But seriously - if you can’t solve for inter-generational redevelopment on a corridor like Burnet Rd that runs between existing family-friendly communities, where exactly in the urban core is it supposed to happen? One of the respondents to last year’s SN community survey observed this one – diverse communities have "eyes on the street" more consistently throughout the day. On my block, there’s a retired gentleman who takes walks up and down the street. I think he’s an ex-marine. We don’t get many break-ins on my block. Mind, "eyes on the street" won’t deter crime if people don’t care. Crime deterrence requires residents who are not only physically present, but emotionally invested. Families and seniors are more likely to invest because they tend to live in place over a longer period. Communities that gray out may also die out. Communities that plan for a mix of housing (and therefore people) are shaping an environment where twenty-somethings can remain and become sixty-somethings. Why Use the "Natural" Age Distribution as a Diversity Target? Sustainable Neighborhoods has defined "demographically balanced" as the natural age and income distribution of the wider Austin-Round Rock region. Talk of baby boomer or millennial bulges is overstated. The natural distribution of people by age is essentially flat, until you reach the age of about 55 where numbers slide off. 1) It’s fair. We’re accounting for the needs of all groups, in the equal proportions laid down by Mother Nature. 2) It's us. It reflect's Burnet Rd’s existing diversity and culture. Why 70% Multi-Bedroom Housing to Protect Age Diversity? Data from several US and Canadian cities show that a community can have a natural age distribution when at least 70% of housing has more than one bedroom. Go below that, and age diversity drops off. This graph shows the percentage of multi-bedroom dwellings for each neighborhood in Vancouver, BC, vs. the percentage of children. Vancouver is a good city to look at, because it has a much wider range of housing types than Austin. Affordability is of course part of the equation, and so is school quality and the services mix. But you can’t explain away this bedroom count data. Housing unit type and demographics are tightly correlated, even more so for middle class communities. Getting a true mix of housing is especially important because once built, it’s difficult to change. Plot of CanStat census tract data for Vancouver, British Columbia. Each dot is a neighborhood. Its location on the graph shows the percentage of housing in that community with at least two bedrooms, versus the percentage of children (age 0-17). The correlation between housing and children is higher for middle and upper class communities. It was interesting to me that there is so much talk in Austin about affordability, and yet Affordability in last year’s SN Burnet Rd survey failed to crack the top 5 reasons respondents live in the Burnet area. One clue – many people in their responses lamented that the area was affordable "when I first moved here." In other words, most of us are moving into the neighborhood at a price point we’re comfortable with. And if after many years of gentrification you can no longer afford to live here, you leave, and your voice in the community is silenced. That’s the citywide frustration that is increasingly resonating at City Hall. Income diversity is just as important as age diversity. I have personally chosen to focus on age diversity because it is a new phenomenon, one that Austin's policy-making circles poorly understand and under-prioritize. There are many people who have studied housing affordability more than I have. In upcoming blogs I’ll be inviting one or more authors to explore different facets of housing affordability in the context of Austin and Burnet Rd. I’ll also run some numbers on housing mix, and look at potential risks of unbalanced housing. What will make a Burnet Rd corridor plan successful? Last month, I wrote two blogs exploring challenges with recent planning efforts that undermine trust. We also had a great Sustainable Neighborhoods meeting on 1/27 to identify problems and start to brainstorm solutions. Below are the meeting results, some thoughts on priority, plus a somewhat embarrassing personal confession. The Sustainable Neighborhoods focus group drew stakeholders with different goals. Several of us were concerned about development impacts on neighborhoods. Others loved Burnet Rd’s revitalization. One person lives in a youth housing co-op and was interested in affordable housing for young people. Another coordinates programs for area middle schoolers. A participant from North Austin called Burnet Rd "my personal highway." A prominent local architect came out who seeks growth that doesn’t undermine neighborhoods. City staff from the corridor plan team and Council Member Pool’s office observed. 2. Participants don’t feel like their ideas are heard or valued, especially nuances. 4. Staff have an information advantage over regular stakeholders. 5. “Left hand, right hand.” Other decision-makers outside the planning process don't understand or respect it. 6. Stakeholder amateurism. Example – stakeholder misinterprets information, and trumpets it in alarmist way. I have experienced all of these. In fact, I am personally guilty of #6 and can illustrate how that works from errors I made in a recent blog. In my post, “City planning: Democracy with Chinese Characteristics,” I described my experience with the Imagine Austin planning process. I called out how City staff developed a biased survey and distributed it before the visioning committee had finalized the vision and goals. A few days after posting that essay, I got an email from Matt Dugan, a City staffer who I greatly admire. Matt worked on Imagine Austin. His email was courteous, but noted that my blog had some inaccuracies that he’d like to discuss. I knew I was in trouble. Matt identified no fewer than three errors of fact in my post. In August 2010, City Council adopted the Imagine Austin vision and goals. Staff only released the ‘Which Way Austin’ public survey the following month. In my blog I cited an example of CodeNext staff deleting photos that my neighborhood had collected to describe our Community Character. The photos weren’t deleted. They are still publicly available on a Flicker account. Staff just couldn’t use them in their housing type poster because of the embedded text. I said that Imagine Austin didn’t treat the Austin Oaks PUD as a growth zone because a highway separated it from the nearby rail line. According to Matt, Imagine Austin’s growth map does include Austin Oaks. Likewise, the Austin Oaks example illustrates a different challenge of planning – “#3 – People Think They Have Agreement on Something, and then It Changes.” During Imagine Austin, I followed the Anderson corridor closely. I heard staff reason out the scope of growth on that corridor. Later, when staff apparently changed the scope, the growth map represented that in an ambiguous fashion that made it hard for me as an interested stakeholder to understand. But my main point here is self-criticism. Stakeholder amateurism is a huge challenge in planning processes. I have a full-time job unrelated to my volunteer work. I’m a dad with three young children. I can’t possibly follow every detail of a highly complex process. Matt said a lot of his time on Imagine Austin was spent responding to untrue statements that quickly telephone-gamed into crises. Incorporate local vocabulary, not industry buzzwords. Terms like ‘Live Work Play’ or ‘Smart Growth’ quickly pick up subjective connotations, both positive or negative. Developing an ear for vocabulary coming from stakeholders can help convey a willingness to listen and understand. 1. Fragmented information. Misunderstandings that turn ugly. 2. Insular communities, busy stakeholders. Most of the heat in a planning process radiates from conversations around trade-offs. Creating a strong sense of fairness and trust is a huge part of getting stakeholders to the table and problem-solving. But the management of goal conflicts itself requires time and effort to get right. Plan governance and execution is where the rubber hits the sidewalk. After a multi-year process and many good intentions, what happens when the first zoning case lands in front of Planning Commission? As I discussed in my previous blog, if the bodies regulating changes to the plan don’t understand the plan’s intent, don’t respect it, and make arbitrary decisions when amending the plan, then the plan process was for naught. 1. Fine intentions of plans get ignored in practice, especially around zoning amendments. Suitability rules are easy to interpret, and directly tied into plan amendment process. Long-term training (certification?) of plan governing bodies. (From Matt Dugan, planning staff) – organize realistic infrastructure investment options into kind of ‘cafeteria menu,’ to get feedback during planning process and prioritize. (From Greg Canally, finance dept staff) – city needs to better sync its corridor zoning, infrastructure and financing efforts. (This effort is getting underway). Staff should assist in orchestrating a consistent public message that ‘retrofitting suburbia’ is a generational investment undertaking that will ultimately pay for itself by shaping a truly sustainable city, but that carries big risks if the city adds density while under-investing in infrastructure. The more that corridor stakeholders hear this, the higher trust will be. In my opinion, if there’s one ‘must-have’ planning policy change that will affect the success of the Burnet corridor plan, it’s developing a much clearer, rules-based way to determine when a change of zoning is appropriate, and when it’s not. Unless stakeholders can see upfront that future plans will be governed more consistently than today’s plans, by the intent of the plan and not by political whim, nothing else proposed above will matter. This piece of the puzzle will be tricky, but deserves careful attention.